Right this minute I’m on a flight over the Atlantic. And someone on that flight is probably farting. I recently test-drove a pair of anti-flatulence underwear on a flight out West and wrote about the experience. The piece hasn’t been published yet (where do you pitch such works of art), but I decided to read it during a recent appearance at West Texas A&M. Here’s what I’ll be doing over the next 6 weeks. I hope you’ll follow along here, at the Nothing Personal blog, the Nothing Personal YouTube Channel, on twitter @kelseytimmerman, and @0_Personal. I’ll keep blogging if you keep reading! I’m not jazzed for the World Cup, I’m much too wrapped up in American sports in which players are allowed to use their hands, but this commercial on ESPN is awesome. There was a fish between the moon and me. Pausing right there in the center of the silver ring. It was a parrotfish eclipse. That or a signal to the crime-stopping Parrotfish Man. I floated 20-feet beneath the surface just off the sea floor, as if in space. A bubble of air escaping from my mask, rising like a shooting star. Inside my lungs, a gulp of salty air. Outside, the Atlantic Ocean. I held my breath. I breathed in the sight. The night was a gift. The surface of the water, indiscernible from beneath, didn’t even have a ripple, allowing the moon and the stars to appear as untouched as if I were on the surface. After sitting next to an anti-Socialist socialist of Hungarian descent who was worried our country was slipping toward torture chambers on a flight the other day, I was reminded of an old column I wrote about visiting a torture chamber in Budapest. I thought I’d share it. It’s kind of a like a Scooby-Doo episode without the dog, chase scenes, leaning towers of sandwiches, and layers of masks. Okay it’s nothing like a Scooby episode. But I do get trapped in a bathroom and the title is…. It’s a rainy day in Budapest. Home is where you are enslaved to your cat, poopy diapers, and lawn mowing. Home is a lot of things. Even the ones that don’t exactly fall under the “awesome” category are missed when you aren’t home. I’m leaving my home in a few days. Next Tuesday I’ll be in Nairobi, Kenya. I’ll be sure to continue the “$10 for Tuesday Project” there. I expect I’ll find some very interesting and worthy causes and people to support during the following 6 weeks, which will lead me from Kenya to Ethiopia, Uganda, and Ireland. The woman next to me works for FEMA. She is employed by the government but hates the direction our country is going. She has all the talking points down – Obamacare, cap and trade, socialist agendas. She’s proud of her Hungarian ancestry and worried that American dissenters will be shuffled off into death camps and torture chambers in the all to near future. She tells me all of this as if I surely agree. As if I hadn’t contacted my congressmen encouraging them to pass healthcare reform. As if I thought Beck and Limbaugh were the greatest Patriots since Mel Gibson in the Patriot. A week from now my bags will sit at the stair landing in my home, waiting to be thrown in the back seat of my car, lugged onto a plane, and tossed across my shoulder on African soil. I’m not really excited. I never get excited to go anywhere but home or tropical beaches. I’m a mix of complex feelings. I know when I spend my first week in the slums of Nairobi with Life in Abundance the feelings will grow in complexity. If I didn’t write about them, I would never make sense of the feelings. Writing helps me make sense of the world. Because he works at Wal-Mart. I got a response and a free Aerobie out of this letter. So I thought I’d share it here. 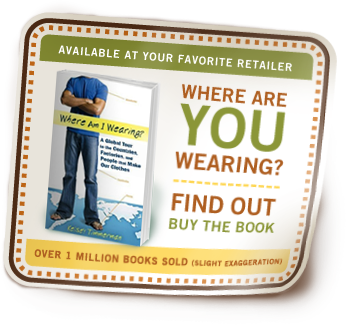 I’m a journalist and author of the book “Where Am I Wearing” and since 2001 I’ve been traveling the world writing about people near and far. There’s only one item that has been with me the entire time – my Aerobie Superdisc. I don’t leave home without it. A de-adulter: Turns adults into kids in a matter of a few tosses.